Joseph’s tombstone has been permanently sealed upon the ground where his little, earthly body is decaying. Sadly, it is the cold, hard fact; his body is withering away under the earth, while his spirit in heaven lives on adorned by his new glorified body. His mere frame of flesh is obsolete and he is soaring with the angels in his forever prime. The abundant life that Jesus promised is Joseph’s now. The single word on Joseph’s tombstone is: UNSTOPPABLE. One word that had to describe his entire life; a potent word. A word that speaks of moving forward and is ongoing. UNSTOPPABLE…a word that I want to encapsulate my life as well. It’s still so surreal to gaze upon this tombstone and swallow that my first-born son is really in the grave. I have to ask myself, “Is this really my life? Did this really happen to me?” As tears roll down my cheeks, a few words resonate in my spirit: GRACE, PEACE, and JOY. Yes, joy, in some strange way. After momentary sadness floods, joy prevails. There is a deep joy knowing that my son is with his true Father. It’s an uncanny joy that he will never have to suffer in this life and that he is home. There really is a PEACE that I can’t explain. I’m really not that strong. I actually am an emotional person by nature so why is it that I feel OK with this? Why shouldn’t I be a wreck everyday? He assures me that He will keep me, cover me, and lead me. His nearness alone can still me! One word from Him. One touch in his presence where I can draw close to him and suffocate the noises of this life. HE IS ENOUGH! His grace soothes the pain. This closeness to a gentle, but yet powerful God makes me UNSTOPPABLE, not MY strength, will-power, or discipline to pick myself up by my boot straps and press, press, press to drown it all out; to hide under a facade of busyness. My nearness to Him and His nearness to me! I have relationship with the Father because of Jesus! I am not this strong. I am held by His love in a relationship with the only one who can water my soul. He is the only thing that satisfies. Is your soul satisfied by Him? Are you UNSTOPPABLE? You can be with Jesus! Josiah living an UNSTOPPABLE Life! So proud of you lady, the few days we spent together I figured you as a kind, lovable, forgiving person. But I never guessed you had this type of strength. Nice job. I may never k.ow the sorrow you felt, thank you so much for sharing. Thank you Charles. That jury duty week was part of a quiet time to prepare me for what I was about to walk into. I wasn’t used to the quiet at that time in my life. Thank you Joy for reminding us to live an Unstoppable life. I loved this post. I cried, my heart ached and then you wrote “I’ve got you” . So true. thank you for sharing this. Thank you Cary! It is only Grace! Joy, we are all grieving and praying for your family! Your family and faith inspires me. I hope you find some comfort in knowing that Joseph’s short but precious life is still affecting people in a positive way! MY PRECIOUS JOY ; AS I HAVE SAID MANY TIMES WHAT A GREAT INSPIRATION YOU ARE TO ME AND SO MANY OTHERS. YES , JOY AND JON YOU ARE UNSTOPPABLE AND WITH YOUR COURAGE , FAITH LOVE , AND TEACHING JOSIAH AND JOSHUA THEY WILL BE UNSTOPPABLE. THANK YOU JESUS FOR LETTING US HAVE JOSEPH FOR A LITTLE WHILE . WE WILL HONOR AND REMEMBER HIM FOREVER. GOD BLESS YOU MY “UNSTOPPABLE “GRAND DAUGHTER. ! Thank you my UNSTOPPABLE grandmother! Thank you Mrs. Stacey! God’s grace is with you too! I have mourned your loss from afar. Your family is so anointed with God’s Love. I know that when we are so close to our Father in Heaven, we are closer to our loved ones who are there beside Him. 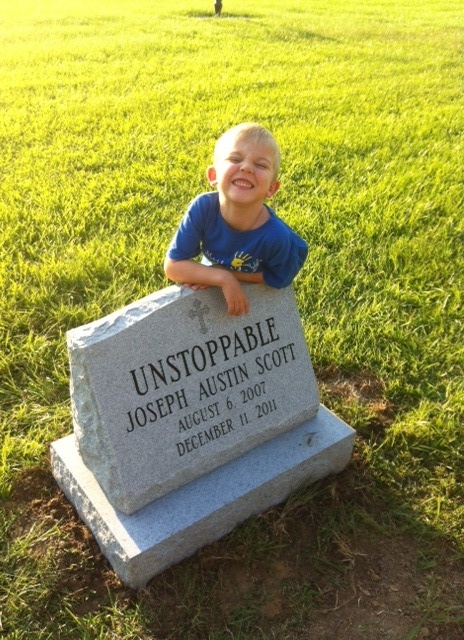 I love your family and your “UNSTOPPABLE” devotion to God and Joseph’s memory. 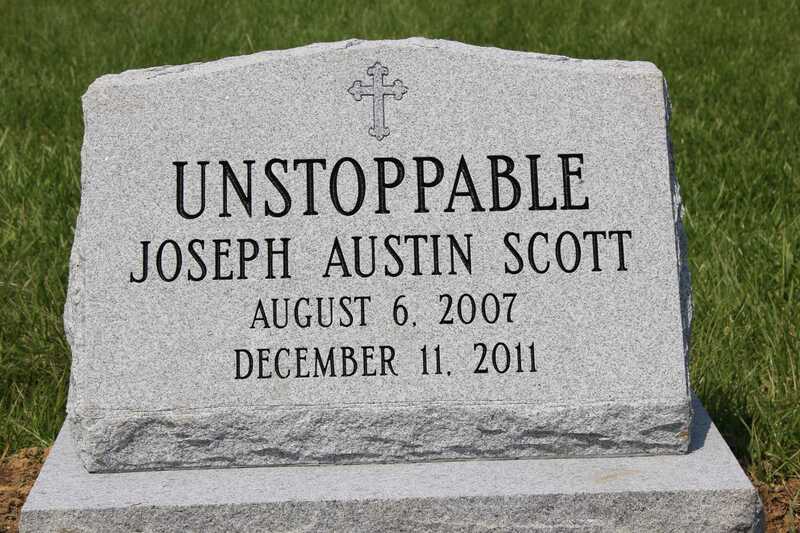 We love you all and feel blessed for having known Joseph and ALL of the UNSTOPPABLE SCOTT’S. Wow. What a beautiful and powerful testament to Gods love and grace. Thank you for sharing your pain and your joy.